The term Chimerica has a nice ring to it. It suggests a kind of cooperation, a friendly unity. And it can’t be denied that in some respects, the growing economic partnership between China and the U.S. has been good for the American economy: Wal-Mart and its competitors help circulate a lot of money. In the 1990s and early 2000s, the U.S. government also saw the growing relationship with China as an opportunity: China’s massive population represents an enormous potential market for U.S. exports. Legislation to normalize trade with China was approved in the Senate 83 to 15, an optimistic and impressively bi-partisan show of support in U.S.-Chinese relations. On Dec. 11, 2001, 14 months after the legislation was signed, China joined the World Trade Organization. 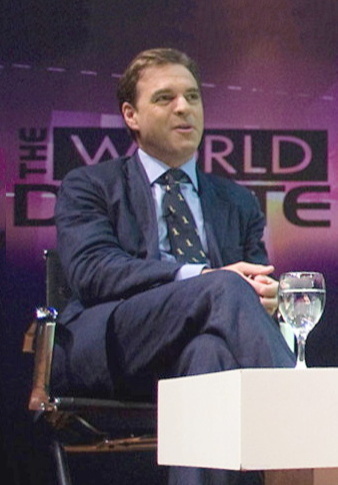 The term Chimerica was coined by historian Niall Ferguson and economist Moritz Schularick in late 2006, to describe the global dominance of the intertwined economies of China and America. Ferguson at the Special World Debate in 2010. Opening trade was a definite boon for multinational corporations like Boeing and Caterpillar, who quickly found a market in the rapidly growing infrastructure of China. The new relationship was not so helpful for producers of smaller, more basic consumer goods. Things like bicycles and vacuum cleaners couldn’t compete with Chinese counterparts in price. The Chinese government only added to the problem with discriminatory import rules and complicated processing hurdles. The financial differences between U.S. and Chinese consumers also limited U.S. manufacturer’s success in China. Chinese consumers on average make a fraction of U.S. consumer salaries, cutting into Chinese purchasing power. In 2003, the U.S. trade deficit with China reached $124 billion dollars and has only continued to grow. The huge Chinese market never materialized, but Americans couldn’t get enough of the cheap goods coming from China to provide “everyday low values” in stores like Wal-Mart. Wal-Mart’s headquarters are in Bentonville, Arkansas, but their global procurement center is in Shenzhen, China. Eighty percent of Wal-Mart’s 6,000 global suppliers are based in China. To put that into perspective, China is the largest exporter to the U.S. economy in nearly all consumer goods categories, and Wal-Mart is the leading retailer in all consumer goods categories. The company and the country are vitally linked, with Wal-Mart importing at least $15 billion in Chinese goods a year, and possibly as much as $30 billion. Of course, if Wal-Mart is vitally linked to China, then so is America. However, the economic landscape is showing signs of change, and that change could cause a huge shift in the way Chimerica works. As we discussed a few weeks back in The Future of Manufacturing: The Good, The Bad, and the Not Too Ugly, Chinese workers are beginning to make more money, and that’s cutting into the value of Chinese manufacturing. This doesn’t necessarily mean that Chinese consumers will buy American products, but it does mean that some manufacturers are beginning to return to the U.S. In recent years, U.S. manufacturing has gotten undeniably stronger, with over 700,000 new manufacturing jobs created in the last five years after a decade of decline, according to the American Manufacturing Partnership Steering Committee. Now, companies like Beijing-based Lenovo are finding U.S. production much more cost-effective. This shift to the U.S. is still far from a full-blown trend, but according to the Boston Consulting Group the U.S. could have lower manufacturing costs than Japan or Europe this year, which would drastically improve the odds of a large-scale manufacturing movement back to America. It’s unclear what this means for Wal-Mart and its methods for maintaining “everyday low prices,” but the retailer’s next move will certainly help determine the future of the Chimerican economy. As always, we invite you to explore the rest of AWS Learning, where you can find online courses, podcasts, virtual conferences, and other digital tools to help you advance your welding career. Do you have thoughts about Chimerica? Let us know what you think in the comments below. We need businesses to come back to America!! !